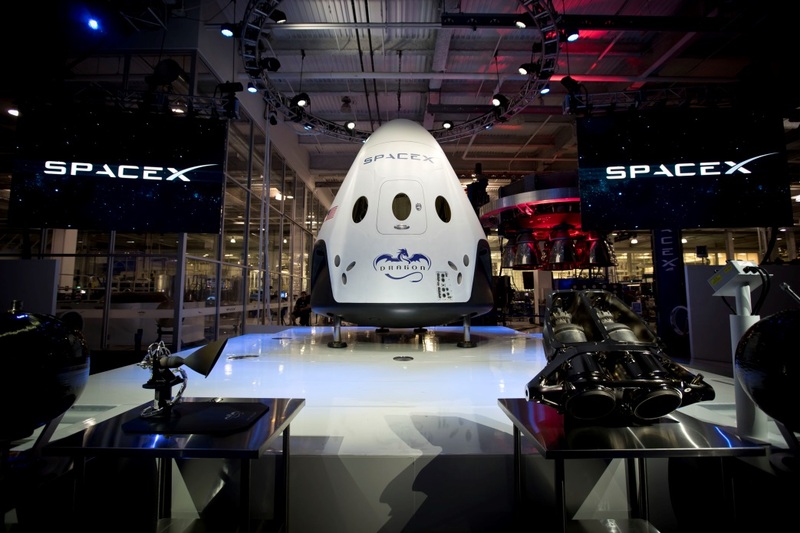 An Ancient Solar System...: SpaceX's Dragon 2 - opening up the solar system? Elon Musk, founder of SpaceX, announced recently that he plans to launch aprivate (unmanned) mission to Mars. The core of the mission will be SpaceX's Dragon Two capsule, an upgrade on the Dragon One model currently flying missions to and from the ISS. Dragon Two - which is currently undergoing testing - will be capable of ferrying up to seven crew to ISS. That's cool enough, but the design isn't limited to ISS flights: It's designed to land on any world with a solid or liquid surface. Above: A mock up of dragon two, on display at a SpaceX facility. In conjunction with SpaceX's planned Falcon Heavy rocket it could put four tonnes of equipment on Mars, land on the Moon, or even put a payload onto one of the Moons of Jupiter. Above: SpaceX's recent landing of it's Falcon re-usable booster. Musk, it seems, isn’t content with less than the whole inner solar system - and he aims to make Dragon Two the standard interplanetary delivery vehicle. Above: Dragon Two tests it's propulsive landing engines. 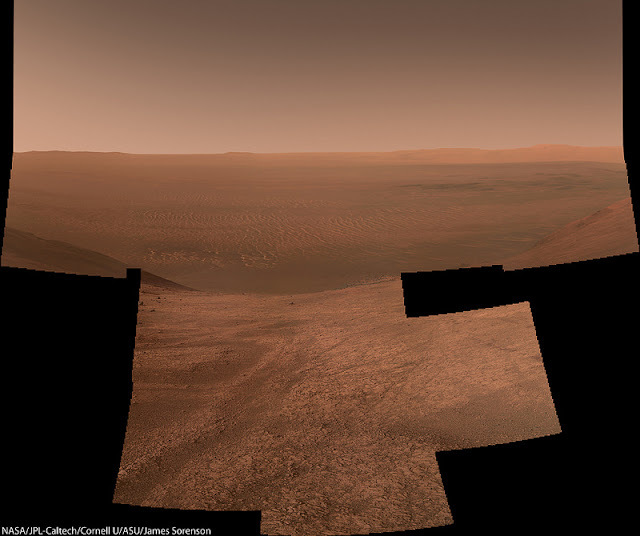 In September we'll find out more details of the planned Mars mission. The internet is already alight with speculation on it, so instead I thought I’d try looking at some of the ideas being raised for using Dragon Two to explore the rest of the solar system. First, some caveats: Putting humans onto another world -possible excepting the Moon or a small asteroid - with just a Dragon Two isn't really an option because many months in a capsule the size of a big shower cubicle isn't great for astronaut psychology. Plus Dragon 2 is designed to land on these worlds, not take off again... which is also bad for astronaut psychology*. Above: An Apollo astronaut . Will humans return to the Moon any time soon? The collection of ices and organic chemicals that have been frozen into the bottom of the Moon's craters of eternal darkness. Areas like 'Ina' which show hints of recent volcanic activity, and if lunar volcanism has completely stopped, are major unanswered questions. ISRU (In-Situ Resource Utilisation): This is one of the big enabling technologies we'll need to develop if dreams, like Elon Musk’s, of expanding into the solar system are ever to be realised. 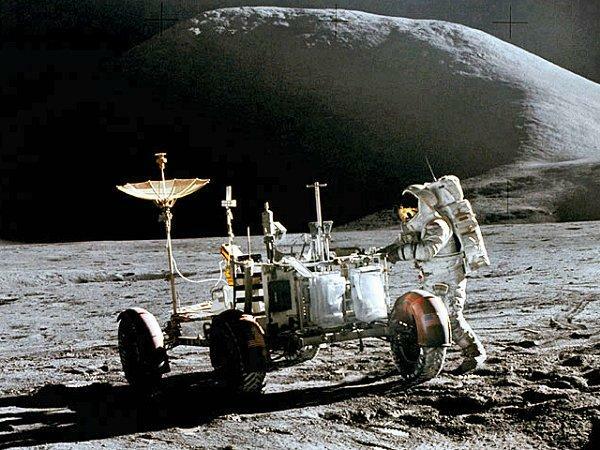 Experiments with using lunar resources for construction and science are also high on peoples list: It would take far less energy to build and launch a vessel from the Moon than it does from Earth. Constructing solar energy farms on the Moon is also being seriously looked at, as is siting supersensitive radio telescopes on the far side, or infra-red telescopes at the bottom of the dark craters. Above: The strange 'Ina' formation, which seems to have erupted in the last million years. Although Musk himself is focussed on Mars, a lot of folks who'd like to begin exploring the Moon again are paying close attention to the Dragon two. 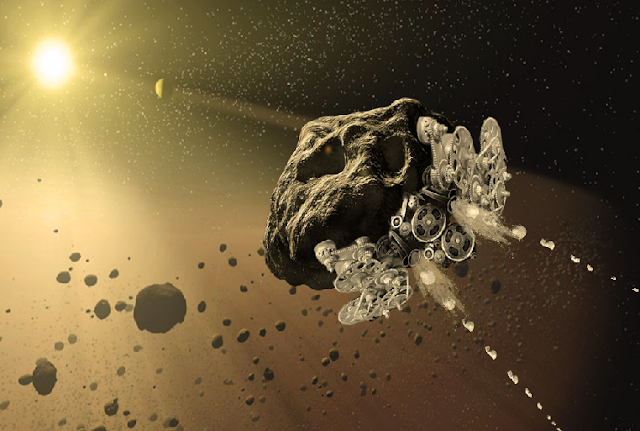 Above: An artists impression of an asteroid being transformed by 3D prinitng. Courtesy of NASA. Dropping a major payload onto a near Earth asteroid with Dragon two would be even easier than landing it on the Moon. With missions like NEAR, Philae, and Hayabusa, we've learned a lot about landing on such teeny objects, and there’s lots of reasons to do so: The possibility of extracting resources from them, studying their geology (which would tell us about how the solar system formed), and even sending a manned expedition are all on the cards – not to mention learning how to move a dangerous one. But one possibility being bought up is that we could use a Dragon two to kidnap one: It's been known for a while that small space rock s - only a meter or less wide - can and do get caught in Earth's gravitational field, becoming 'quasi moons'. A heavily modified Dragon two capsule could track one of the smaller ones down and bring it back to Earth intact. Only tiny amounts of guaranteed uncontaminated asteroid material have been returned to earth to face the full battery of scientific investigation. Landing equipment and supplies for a manned mission: Any future 'boots on Mars' effort will have to include a long stay on the Martian surface - partly to make the time and money well spent, and partly because orbital mechanics dictate that there are better an d worse times to make the crossing. So dropping supplies onto the surface with Dragon 2, ahead of the main event, would make the whole thing more do-able. Send a greenhouse: Dreams of terraforming Mars rest on the idea that, with some do-able modifications, the Martian environment could support plant life from earth. One mission being floated around the 'net is landing an inflatable greenhouse, and experimenting with growing living things on Martian soil. That might also give any manned missions the handy knowledge of how to grow their own supper while on the red planet. ISRU experiments: Much like on the Moon, this means learning to use native resources of another world, such as ground ice, minerals in the soil and rock, and even the gasses in the air, to build, maintain, and power human activities. 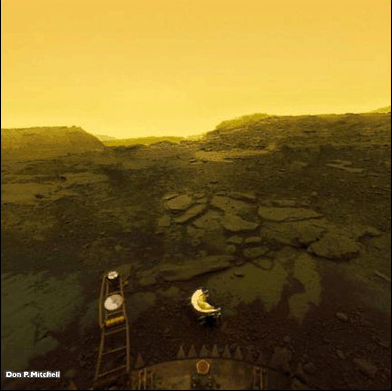 Above: the surface of Venus, as seen by a short lived Russian lander. At one point the whole surface seems to have been overtaken by a massive volcanic catastrophe. There's definite signs of active volcanoes on the surface today. The atmosphere is a complex mystery of interacting chemical processes. The atmosphere also contains a layer, at 70km altitude, which is actually the most Earth like environment in our solar system, and might one day be suitable for a manned visit by a balloon bourns space craft. As well as the possibility of landing some kind of hardened probe on the Venusian surface, Dragon 2 could be used to drop a serious balloon mission into the atmosphere. Venus air is less like earth's atmosphere, and in many ways more like our oceans - there are plenty of mysteries, and even speculation of airborne bacteria, that could be explored without needing to go near the hellish surface. 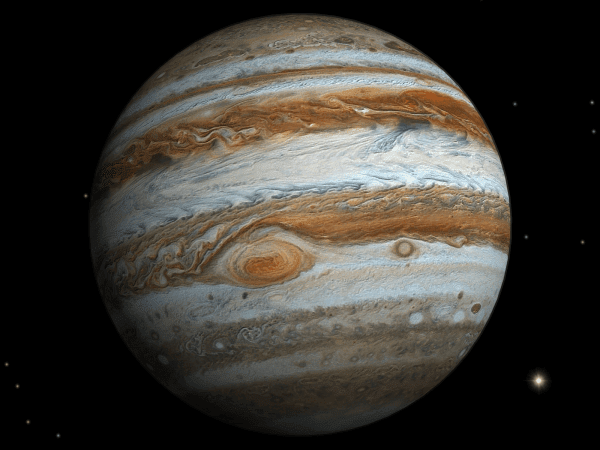 Above: An artists impression of Jupiter, seen below the plane of its moons. The most volcanic world in the solar system, Io's surface is a complex and ever changing smorgasbord of lava lakes, gigantic volcanoes, and complexsulphur based chemistry. A lander mission to Io would open up a window onto one of the most fascinating and alien environments in the solar system, not to mention being an enormous technical achievement. The other world in Dragon 2's range which could easily have a whole book written on it, Europa has had astrobiologists practically drooling ever since it became clear that there's an ocean beneath the icy crust. Kept liquid by the heat from Io-like volcanoes, how far below the ice the ocean lies is upfor debate. Jumbled regions of ice called chaos terrain suggests that there are areas where it can break through to the surface. More evidence of the ocean reaching the surface emerged last year, when a plume of water vapour was seenshooting up above the surface by Hubble. A lander mission in then right spot could give us a chance to sample ice that was once water in the ocean - and if that ocean supports life the evidence for it could be right there to be picked up. Although it doesn't receive the same amount of tidal heating as Europa, Callisto may well have its own internal ocean, albeit at over 150 km depth. it's surface is ancient, and something of a mystery - it's not clear exactly how old it is, or if it ever interacted with the internal liquid layers. Organic compounds have been detected on the surface, suggesting that there's scope for life-like chemistry to have gotten started if the surface did have contact with the ocean. Yet another world with an internal ocean, Ganymede is the largest Moon in the solar system, and like Io and Europa, has a hot core capable of driving geologic activity. The cores churning gives the moon a planet like, magnetic field, and it even has its own faint aurora's. Ganymede’s surface is broken into brighter and darker areas, possibly indicating that some areas were changed by cryovolcanism - which would mean that a lander on Ganymede might have a large selection of material from the internal ocean to study. 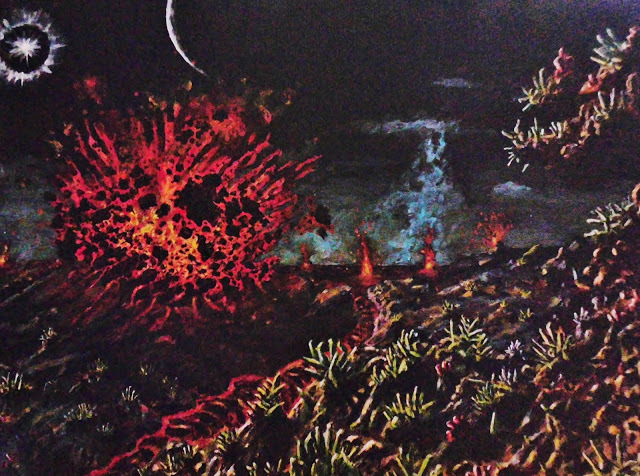 Above: An artists impression of the surface of Io, near a lava lake. *Although, in all seriousness, a one-way manned mission has been suggested. You don't need a Dragon Capsule to land on Venus. The athmosphere is dense enought to land at a survivable terminal speed with no parachute nor jets. Venera probes did it.